This is a sample entry from Tom Dosdall’s newsletter, Technical Ag Knowledge, published on Wednesday, June 28, 2017. 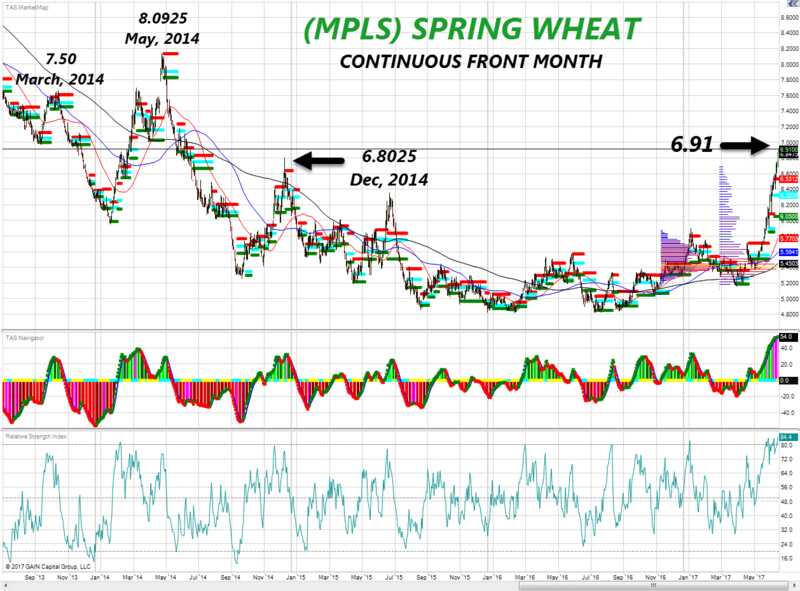 Spring wheat cleared an important technical hurdle during overnight trading and is now at levels not seen in the front month since June, 2014. Technical indicators continue to project extreme overbought conditions so it will be key to see if the market can hold above 6.80, in my opinion. Next major level of resistance could be around 7.50 from March, 2014 and then 8.10 from May, 2014. Reminder: July grain and oilseed contracts have First Notice Day this Friday so if you are long you should be looking to roll out at this time.